UPDATE: Driver was admitted to the hospital for his injuries. Officers will be submitting a DUI/Narcotics case to the District Attorney for Review. Summary: Officers responded to a collision involving a single vehicle into a commercial business. Upon arrival the officers observed an occupied white sedan that was partially wedged into the second floor of a dental office. They determined the vehicle was traveling at a high rate of speed, northbound on French approaching 17th. The driver continued northbound and struck the raised center median on 17th, which launched the vehicle into the air. 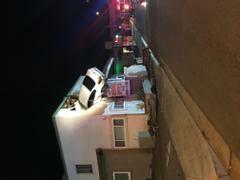 The vehicle struck the 2nd floor of the building and remained lodged. OCFA responded to extricate the occupants, who all sustained minor injuries. The driver, who admitted to using narcotics, will be admitted to a local hospital for observation. Public Works responded to examine the integrity of the structure and LA County Fire responded with a larger wrecker truck to remove the vehicle from the structure.